Scabbed, bruised, punctured, gnarled, undersized, crooked. Here's to imperfections, and unrecognized beauty. Ask your farmer or produce manager for any "seconds", the ugly and discounted produce that often gets thrown away. Food waste statistics in our country (and around the world) are distressing. Food gets tossed for many reasons, and we each play a role, whether it’s scrapping leftovers forgotten in the fridge, or easily overlooking bruised or dented fruit. But really, there are simple acts we can do each day to combat this ill, such as using fresh eyes at the market and in our own kitchens, using and respecting what’s there already, however imperfect or seemingly unflattering. Here’s a simple, seasonal, and perfect recipe that captures that idea, and credits resourcefulness. A discounted bag of mottled Haralson apples here, ready to be transformed into applesauce. Get the kids involved in the making of this recipe; depending on their age, they can peel, chop, stir, or even simply choose which spice to add in the end. Add the juice of 1 lemon (minus seeds) to a medium-sized, sturdy saucepan. Peel, quarter, core 3 pounds of apples (look for "seconds"), cutting the quarters in half, and add them to the saucepan, continuously tossing them with the lemon juice. (The acidity in the lemon juice will preserve your apple’s color, and the lemon adds a tart dynamic to the finished sauce.) Add ¼ cup of water and ¼ cup of sugar (or honey, if you prefer) to the apples and stir. Cover your saucepan and pot on a low heat on the stovetop. 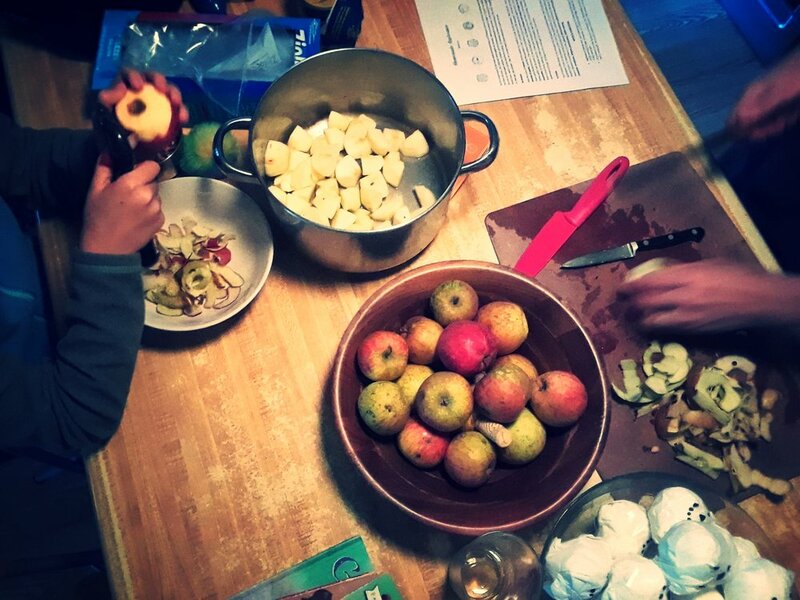 Stir from time to time, adding a little more water if the apples seem dry or are scorching. Check for sweetness as you go, stirring in a bit more sugar (or honey), if you desire. You’ll notice after about 10-15 minutes that the apples are breaking down, and it looks like chunky applesauce. If you (or your eaters) prefer more of an apple puree, you can stir enthusiastically with a wooden spoon, or mashing enthusiastically with a fork, to further break down the sauce. Once the sauce is the texture and flavor you like, you can choose to stir in a pinch (or two) of a spice, such as cinnamon, cardamom, allspice, ground clove, and/or nutmeg. Applesauce freezes well, and I encourage you to make more than you think. Freeze in single-serving storage containers, or in Ziplock-style bags, labeled. Simple thaw in the fridge overnight. Applesauce can also be put up (or canned). Your homemade canned applesauce is such a sweet gift, and is such a treat to discover in the pantry come spring. You can add a few peeled, cored, and chopped pears or quince to the apples, to add a bit more seasonal character.